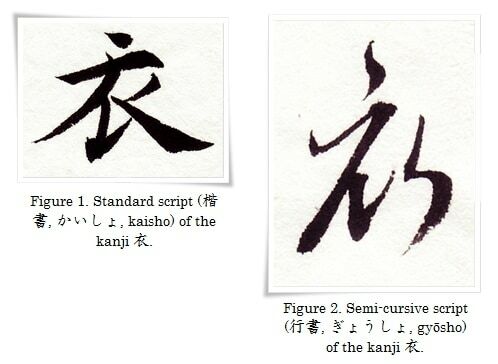 The modern form of え comes from the cursive form of the kanji 衣 (え, e, i.e. “garment, clothing, etc.”). Follow the progression of the different scripts shown in Figures 1 to 3 to understand its origin. Figure 1. Standard script (楷書, かいしょ, kaisho) of the kanji　衣.　Calligraphy by 品天龍涙 (ぽんてりゅうるい, Ponte Ryūrui), ink on paper. Figure 2. Semi-cursive script (行書, ぎょうしょ, gyōsho) of the kanji　衣. Calligraphy by 品天龍涙 (ぽんてりゅうるい, Ponte Ryūrui), ink on paper. Figure 3. Cursive script (草書, そうしょ, sōsho) of the kanji 衣.　Calligraphy by 品天龍涙 (ぽんてりゅうるい, Ponte Ryūrui), ink on paper. Figure 4. Calligraphy of the hiragana character え. Note the corresponding shape with the cursive form of the character 衣. Calligraphy by 品天龍涙 (ぽんてりゅうるい, Ponte Ryūrui), ink on paper. Figure 5. The word えい (えい, ei, i.e. “eternity”) written in Japanese Kana (かな) script. 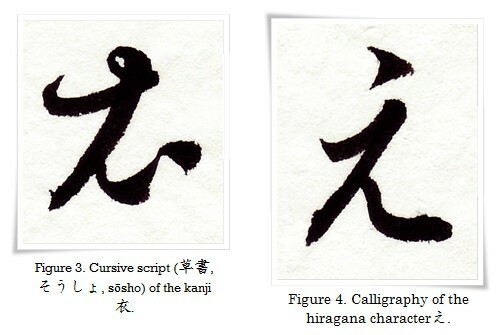 The hiragana character い is based on the cursive form of the kanji 以 (い, i, i.e. “by means of”, “because of”, etc. ), which was explained in our previous article. Calligraphy by 品天龍涙 (ぽんてりゅうるい, Ponte Ryūrui), ink on paper. I am studying Japanese at the moment. My teacher friend told me about your page. I didn’t know about calligraphy, but it looks like a special art! My friend said that you are not Japanese but have very strong passion for calligraphy, and I can see it on your page!! Thanks, Erika, glad you like the page. Many people think that I am Japanese, even the Japanese who I study the calligraphy with ask me if I am sure that I am not Japanese. It alsways makes me chuckle. The young generation in Japan is forgetting the roots and culture. It’s sad but true. I live through the art of calligraphy, and there is no day when I do not wish that I had insomnia, so then I can study it without wasting my time for sleeping ^_^.